Great cards...thanks for joining us this week at CCC!!! Adorable cards. 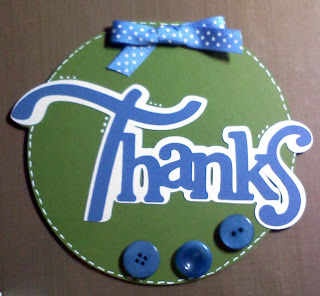 Did you cut the thanks from gypsy or wild cards? Love the addition of buttons and ribbon. And what great parents you have to give you gypsy! Thanks for joining the fun at CCC. Wonderful cards! So glad you could share them with CCC. You're going to love your Gypsy. Talk about an addiction. I take mine everywhere. Too Cute. Very nice colors.